With one natural ingredient, it’s easy to remove years of rust from antiques, artifacts, and tools. A few months after I sold my first horse, I was walking through the pasture and found a shoe he’d lost sometime in the year before. Looking at it, I thought it would be a nice keepsake- and something I could use to create an equestrian project with sentimental value- it was covered with layers of rust. I’d been experimenting all winter with using citric acid to clean rust off garden tools that I, in my easy distractability, tend to leave out in the elements. As it turns out, the basic combination of citric acid, water, and time completely removes rust from metal. I was pretty thrilled, especially after trying and mostly failing to remove rust from tools with caustic chemicals like CLR and The Works. A common ingredient in canning recipes, citric acid is an organic acid a little stronger than vinegar, depending on the concentration you mix it in. 2019 Update: I’ve loved reading your feedback on this article and how many of you have found this tutorial useful! FYI A lot of the comments have suggested replacing citric acid with vinegar and soaking a little longer, but to have success with vinegar takes several weeks and more money’s worth of vinegar, so for a faster, cheaper result, stick with the Citric Acid. Pure Citric Acid – You can buy this wherever canning supplies are sold, however, the pricing on citric acid sold for canning includes a huge markup. As of spring 2019, Ball brand citric acid is priced over $1/ounce but a 5 lb bag of food-grade Citric Acid is 18¢/ounce. My advice is to order in bulk and don’t worry about having too much – it’s SO handy for cleaning! A tablespoon of Citric Acid is great for boosting dishwasher detergent, descaling coffee makers, getting grime off pots and pans, removing hard water stains, and general cleaning. You can use it in cooking too- soaking cut apples in a weak citric acid solution to prevent browning, or adding a tablespoon to bone broth at the beginning of the cooking process to help break down bone and transfer nutrients into your broth. 1. Scoop the powdered citric acid carefully into your bucket. I add about 1/3rd cup of powder per gallon of water, but you can use more or less depending on how rusty your object is and how quickly you need results. 2. Fill your bucket with very hot water and stir to dissolve the citric acid powder completely into the water. There should be no grit at the bottom of the bucket. 3. Place your rusty object in the solution. In this case, I’m de-rusting the horse shoe and I’ve tossed in some rusty bolt cutters since I’ve got project all set up. Use hot water and make sure the citric acid completely dissolves. 5. Let the rusty items soak in the solution. After 10-15 minutes you’ll see bubbles forming on the surface of the object as the acid reacts with the rust and creates tiny gas bubbles. Continue soaking your object until you see visible results. After a day you may want to remix your citric acid solution (it will slowly lose acidity as it breaks down the rust) And if you are a fan of instant gratification as I am, you may want to do a bit of scrubbing to speed the process. Scrubbing is optional but speeds the process up significantly. The acid will loosen before it completely dissolves the rust, so much of the rust can be effortlessly wiped off after an hour or two in the solution. The remaining rust in the grooves of the horse shoe bothered me, so I remade my solution and let it sit overnight. DO NOT reuse the same solution for a second round. The chemical reaction that dissolves the rust changes the chemical makeup of the solution, making it ineffective for additional rust removal. 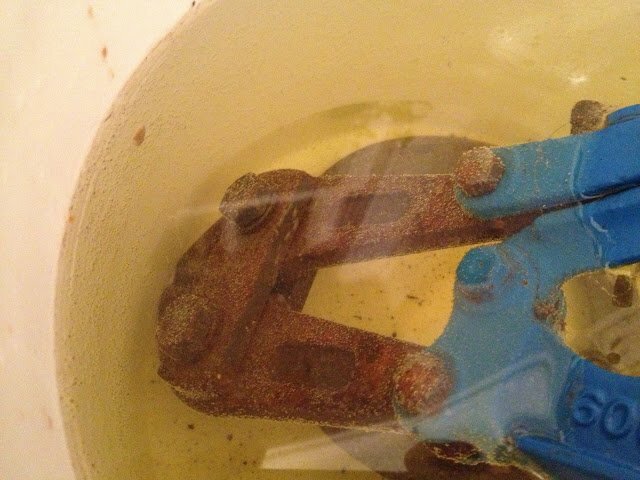 In this photo you can see the yellow-tinge the solution takes on as it is working, as well as the loosened rust sediment that will settle in the bucket. When you are pleased with your object’s new finish, dry it completely. The metal may seem “dirty” and rub off dark marks on your hands, this is normal for steel and iron with no protective coating. Make sure the object is totally dry (10 minutes in a 300-degree oven works great as long as the item is 100% metal with no plastic grips or other heat-sensitive portion) and then add a finish protectant. You MUST protect the finish. If left uncoated, the unprotected metal will rust again almost instantly. You can apply clear coat / lacquer, or just spray with cooking oil and wipe away the excess oil. … and enjoy the final result! Since publsihed, this article has traveled far and wide and collected a lot of feedback comments- many indicating that “just use vinegar” was a comparable solution. Recently, I decided to do a side by side comparison of vinegar vs citric acid in my kitchen. Without repeating the entire rust removing process (difficult to compare with scrutiny since no two objects rust exactly alike) I ordered some pH testing strips. To be the “better” rust-removing soak, the winner would need to be 1. higher in acidity, 2. lower in cost, or 3. both higher acidity and lower cost. My suspicion was that citric acid would win by a landslide, but my experiment progressed. I mixed one cup of citric acid solution at the concentration recommended above (.33 cup per gallon, or in this case, 1 tsp citric acid to 1 cup water) and tested it against a leading name brand of undiluted white vinegar. Adding 3 teaspoons of citric acid powder to 1 cup of water lowers the pH a full point. At major grocery outlets, a gallon of vinegar seems to run about $3-$4. Therefore, rust treatment with citric acid costs about 75¢ per gallon, while the same process with white vinegar costs $3-$4. Given that the citric acid solution is stronger, and thus faster acting, it’s the obvious choice to rust removing with this method. If this tutorial saved you a ton of scrubbing, would you consider saying thanks by buying me a coffee or becoming a $1 per month patron of the creative cavorting behind Hawk Hill? spray with WD40 after is also a great protector. 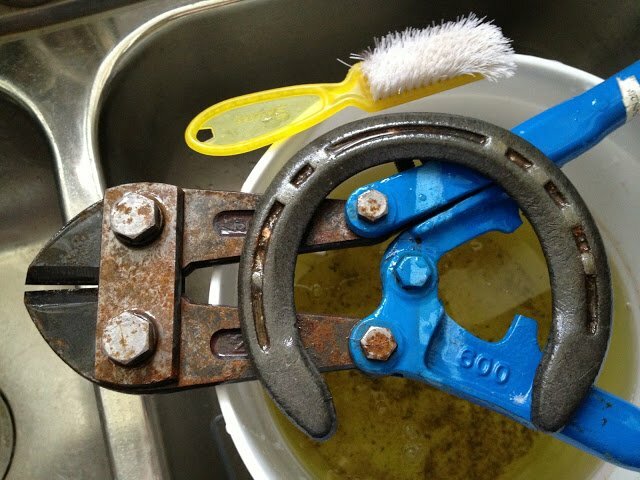 Soak the rusty horse shoe in vinegar. One hour or to over night.. Take out of vinegar and rinse with a brush to remove rust from nooks and crannies. No elbow grease needed. If there is still more rust, continue soaking. Rinse and dry immediately. Rub with cooking oil to keep it from re rusting. Vinegar doesn’t eat good metal like citric acid will. You can see a video on YT that metal objects and tiny delicate springs were still there after sitting in vinegar for 9 months. Citric acid would have dissolved the metal into solution. White vinegar in hot water will do the same. Just let it soak over night. A good source for Citric Acid is No Sugar Added Lemon Cool-Aid (or equivalent as long as there is no sugar in the mix). Citric acid is generally the first ingredient listed and therefore has the greatest percentage of the mix. That would be a great idea for removing rust from small items like coins or medallions if you were in a hurry and had it on hand! But you can actually get a couple pounds of pure citric acid for the price of what you’d pay for 2 dozen kool aid packets. 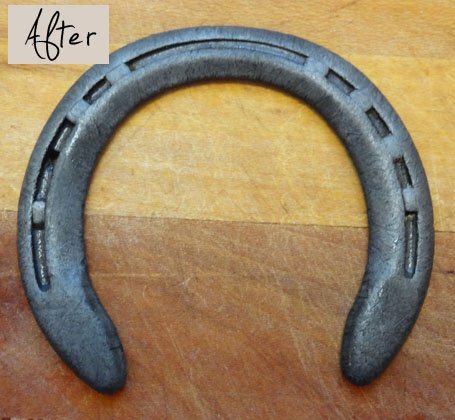 I’ve cleaned many many horseshoes with a wire wheel on a bench grinder, which does a great job but the grooves are always a problem because the wire doesn’t get down into the grooves easily. Besides rust, there’s always a whitish dirty powdery residue in the grooves. I’m not sure soaking in citric acid would actually get rid of it but will try. That’s a good idea to do it quick! Try the citric acid- I think you’ll be surprised! Does this work with cast iron?? Hi Alissa! It totally works on cast iron! It won’t remove the black seasoning but will definitely remove rust from unseasoned spots- I’ve tested that! Just be sure and season your iron immediately, or it’ll rust again within hours! I bought citric acid in the canning section at Walmart for $2.97 (Ball brand). The whole bottle equals about a cup’s worth. Dumped it in a 1.5 gallon bucket of hot water and soaked some rusty stuff for 24 hours. You can definitely see the bubbling action. Did a good job but the items still need some high speed buffing from the wire wheel on the bench grinder. As far as just what this will work on, it doesn’t matter. Rust is rust and it’s the rust the acid is dissolving. It’s much more economical to buy the citric acid by the pound on ebay but I wanted to experiment first. I read somewhere that anti-freeze would remove rust by soaking but I tried it and it didn’t do anything whatsoever. Cant wait to try this! what a time saver! try apple vinegar. Its also an acid and will even remove dried concrete from your tools. I use apple cider vinegar, soak for 2-3 days. Reuse several times to make it cost effective. Shoes come out looking new as in your after photo. Loosens that gunk in the groove too! Another very good way to remove rust is to soak in a solution of molasses and water. I use this method all the time to restore metal and it consistantly gives great results. Leanne, how much molasses do you add to how much water? WhaT do you do with the used solution? Down the drain? Is it hard on your pipes? I don’t think it would hurt to dump it- it’s definitely much gentler on your pipes than many household cleaners and might do some good on any buildup or corrosion on your pipes! On a really ruted project, though, you’ll end up with some sediment at the bottom of your bucket- so if the bottom is sludgy you may want to throw that in the trash! Have you ever used a pH strip on the used stuff to see how acidic it still is? I’ve forgotten most of my chemistry, but I would think the interaction with the rust (which is oxidation, right?) would change the pH. Perhaps it isn’t the least bit acidic afterwards? What would be the best fer a old logging chain? People need to get it through their head that rust is rust. It doesn’t matter what the object is. Molasses and water work really well too. This is a great post. I’ve used this technique for many years and it has never failed me. Hand saws, gardening tools, even objects on my boat that has been subjected to the harsh salt elements come clean and functional again. I like to use rustoleum invisible barrier after this process. Have some tools that despite some neglect, still haven’t rusted after years afterwards. How about using pure lemon juice? Will that work on rust? Has anyone tried it? I think it can work for small projects (for example rubbing a lemon on a butter knife with rust spots) but I don’t know about larger, very rusty items. I do not know the science behind this (would love to be enlightened if a chemistry buff can explain, though!) but based on the fact that sometimes the solution needs to be remixed to remove rust completely, I’m guessing something about the chemical process that removes the rust neutralizes the acid. Therefore, (again, just a guess), I think the more rust present the more acidity and/or time spend in a lower acid solution is needed to dissolve it away. Thank you. I appreciate your response and it gave me more understanding of it, when you stated the part about the item possibly needing a less acidic solution …I’m not sure of the science either, but that is something to consider. Has anyone tried phosphoric acid? I think its the acid sold to remove cement marks on brickwork. I do frequently use phosphoric acid. I don’t even soak items, I just brush it on and rust will change into a protective coat that you can paint on without further preparation. If you don’t like having a coating, quickly remove it with a wire brush. I usually leave it as protection on tools or just spray paint it. Have you ever done this with rusty portions on a nylon or cloth material (Ex: horse tack) to get the rust off the metal portion? Will it hurt the cloth? phosphoric acid. fumes– it can be very dangerous. Good and fast for brass and copper, but I don’t use it on iron. I have used Diet Mountain Dew on an old car heater fan that had 45 years of collective rust and it came out rust free after 3 days of soaking. I did a little brushing where I could and it looked great. Use Diet Mountain Dew as regular leaves a sticky residue. Poured it in a bucket and covered the items I wanted cleaned. Worked great. Have not tried this idea though…may have to give it a whirl. Was more expensive than this method but, its what I had on hand at the time. Sand blasting works great, but use a softer abrasive like aluminum oxide for a better surface finish. Cast iron collectors often use a electrolysis tank to remove rust. Check out http://www.castironcollector.com/electrolysis.php or just google “electrolysis tank” for plans. I have been using white vinegar and water for several years to remove both rust and mill scale. 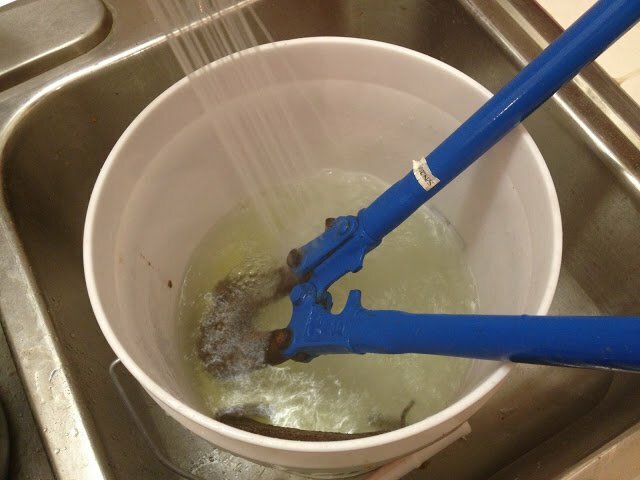 Place in a five gallon bucket with the metal you want to clean for a day or two. Once clean to your liking, rinse with clean water and dry. You may have to wipe the pieces with a paper towel or cloth, but it will definitely do the job. You may also paint with vinegar to obtain a rust patina, the more the darker. Muriatic acid is highly corrosive to metal plus the fumes it produces are extremely toxic, don’t do it ! I simply buy ‘cleaning vinegar’ at the local box store for this purpose. It has a higher acid content than vinegars used for food. Besides, it’s dirt cheap and ready to use straight from the bottle. I always keep a couple of gallons handy. Also, the dissolved rust solution makes a beautiful red stain. I frequently do clean horses shoes and thee answer is good old elbow grease. I am gunna try baking sodi and vinegar thou. I have done thousands. I weld in the winter, furniture tables and itshellcleaningthem. I have a very old metal dresser and it is very rusty. I don’t want anything to eat through the metal. It has no holes at all and in good shape so I want to preserve it. Any suggestions? I have an old brass torch that has green stalagmites on it which is pretty bad. I was wondering if Citric Acid would work for this case? Muratic acid will clean it up in a few minutes. Soak a rag in the acid and wipe it down, let it set a couple pf minutes then dip in a bucket of water. Check it over, repeate as required. Safety measures, gloved goggles, mask, ventilation. NOTE: dry before second wipe! I have some old rusted horse hames that I will try this with. Will probably find a portion of old gutter to submerge it in. I went to Amazon and there were so many choices of citric acid…….organic, etc. Which brand do you use? I’m so excited to try this. Thanks! 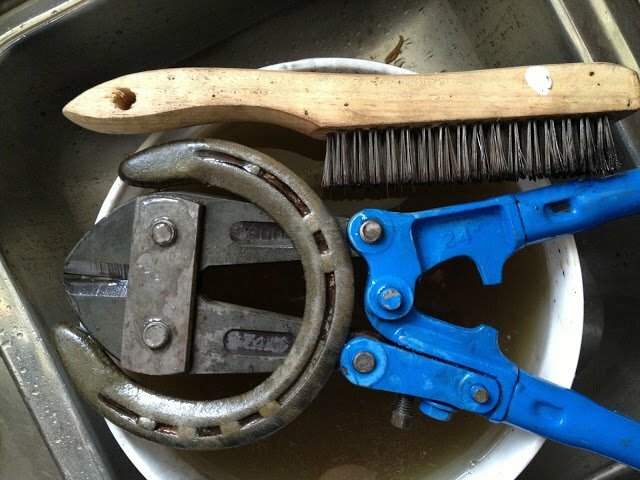 I use a lot of horseshoes and soak them in water for a few days to soften the mud and grit in the grooves then clean them off with a wire wheel on an angle grinder. Use a circular brush on an electric drill for the grooves. Takes a few minutes per shoe. 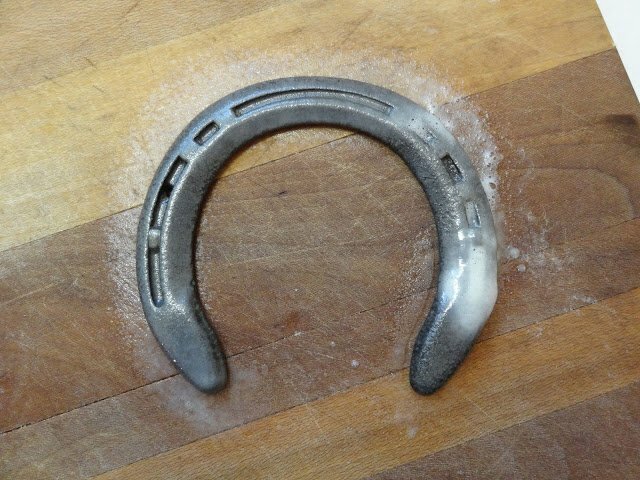 If you are not in a hurry , white vinegar does a stirling job on heavily rusted horseshoes . I left a few in solution for around 2 weeks out in the shed and when i got around to having a look at them the rust literally slid of them exposing clean grey metal . I was totally amazed by the result and the best bit is white vinegar is dirt cheap ! WOW! 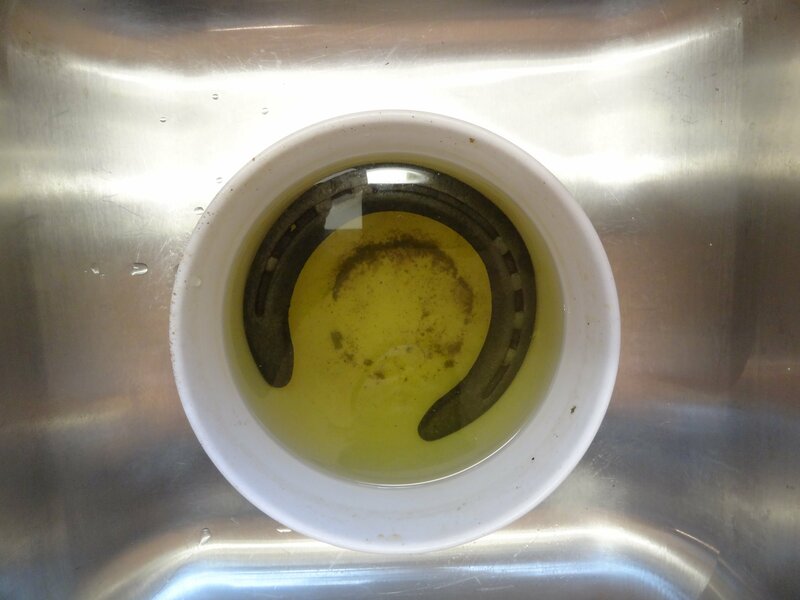 The citric acid cleaned the horseshoes ….clean as a whistle over night! LOTS FASTER THAN VINEGAR! I never knew about this use of citric acid…..I had only used it in my home canning! Regular white vinegar works great, especially if you heat it in a pot or microwave first. Also, cleaning vinegar is even better, as the acid content is nearly double that of regular vinegar. Again, warm them first, then soak your items. This stuff is also dirt cheap. It’s about $1.75 for a half gallon. You can also buy hydrochloric and sulfuric acids in the plumbing department at nearly every hardware store, also pretty darn cheap. Just remember to dilute it first. It’s true there are so many options- the Citric Acid is helpful because it’s cheaper than vinegar, works much faster, and is something many people already have in their kitchen. I recently acquired my grandmother’s Singer sewing machine which is coated in rust since it’s an heirloom I would love to try and preserve and get it back to its natural beauty. Do you think the citric acid would work on it as I don’t want to scrub and risk losing the singer stamp on it. I recently restored my great uncle’s WW1 helmet by using tea as suggested on a military website (it didn’t require scrubbing at all) but I am thinking this wouldn’t work for sewing machine as the metals are different. The sewing machine is cast iron and helmet some sort of steel I think. Hmmm, I’m not an expert on antique sewing machines- but as long as you could keep the surface damp with citric acid solution it might work. I’m assuming you would not be able to soak the sewing machine, but you might be able to lay a towel over the rust spots and use a strong citric acid solution to keep that towel damp.